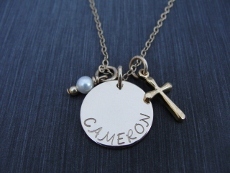 Our gold necklace is a custom 14 karat gold filled disc that is hand stamped with the name or affirmation of your choice. The discs are stamped with our script font. There are three different disc sizes to choose from, 1/2", 5/8" and 3/4". The 1/2" disc will hold up to 7 block or 6 script style letters, the 5/8" disc will hold up to 10 block or 8 script style letters, and the 3/4" disc will hold up to 13 block or 10 script style letters. The discs are stamped around the bottom and are hung on 14 karat gold filled link chains measuring 16", 18" and 20".